1 liter red wine, usually a heartier red, although I suggest staying away from Cabernet Sauvignon. Cheaper is usually better because the mulling decimates the nuance of the wine. Decent boxed wine or jug wine often works wonders on the palate, the brain and the wallet. Put all the ingredients in a pot on low heat with a lid on or partially on for 1-3 hours. 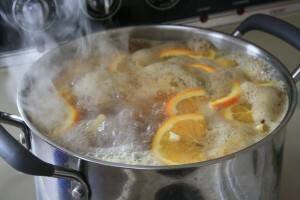 If the mixture begins to boil, remove the lid momentarily. The key to mulling is to heat up the ingredients without boiling off the alcohol. 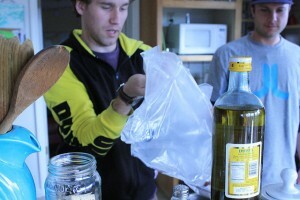 The author emptying the last of a bag of boxed wine into a pot for mulling. 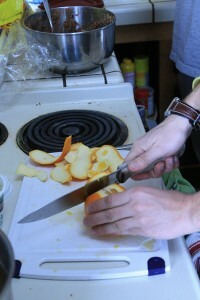 Cutting the rind off of an orange. The more rind, the more bitter the hot, mulled wine. 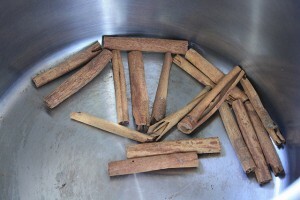 Cinnamon sticks sit at the bottom of a pot before the wine is added on top. The hot, mulled wine should not get this hot. Do not boil.